Like many cities in Europe, much of Vienna’s intoxicating character is due to its well-preserved architecture and the long-held traditions contained within. Beautiful old buildings bear testament to a city that steadfastly clings to its past. About a century ago, Adolf Loos, a Vienna resident and one of the world’s first “modern” architects, wrote a series of cultural critiques which ran in one of the local Vienna newspapers, The Neue Freie Presse. In one of his articles he decried the resistance of the Viennese to embrace the “modern” world. In his article Loos mocked the residents of Vienna for their curious habit of dressing in the traditional style of country folk, pointing out that in London, people had quite appropriately adapted to the practicalities of their modern urban environment and found a way to dress accordingly. Walking the streets of Vienna today, you will still come across lots of people who would not look out of place one, two, or three hundred years ago. There is truly a stalwart resistance to change in this beautiful city and we can be thankful for its stubbornness, as it enables us to step back in time. 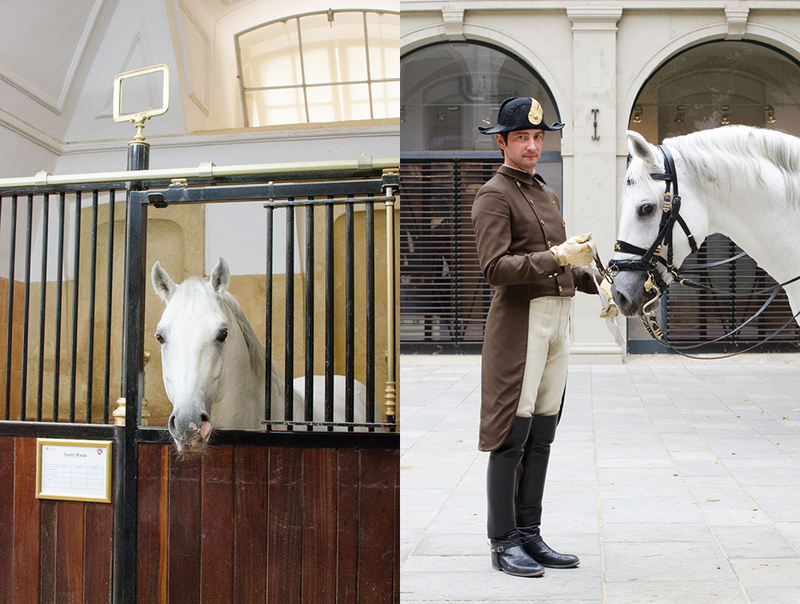 To take this to the extreme and really delve into the oldest of Vienna’s unchanged institutions you should not miss a visit to the Spanish Riding School (Spanische Hofreitschule). 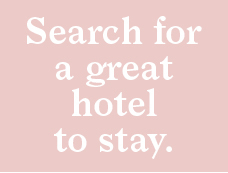 Here you can put the modern world behind you and immerse yourself in the past. Everything about the school is steeped in tradition: The daily routine, the uniforms, the architecture, all have remained essentially unchanged for hundreds of years. 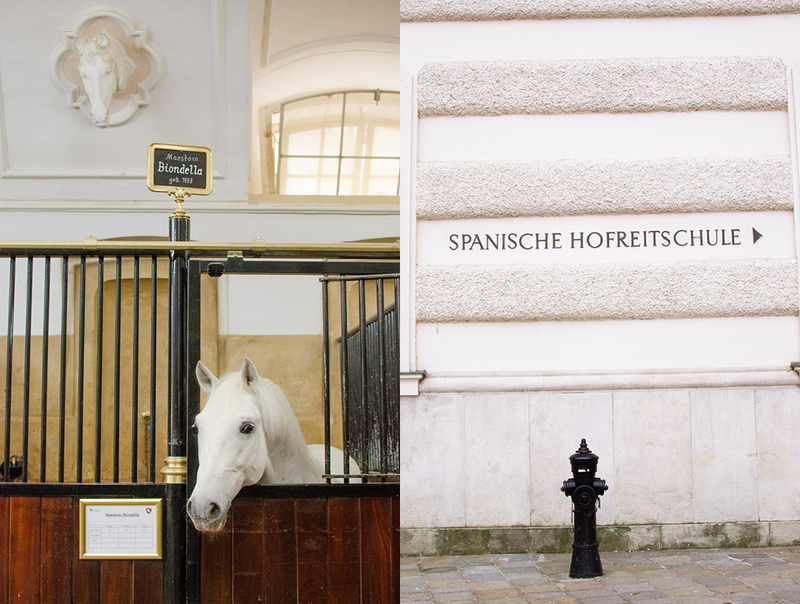 The Spanish Riding School is located right in the heart of the first district, next to the Hofburg, former residence of the Emperor, and coincidentally, just a few steps from one of Adolf Loos’ most famous buildings. 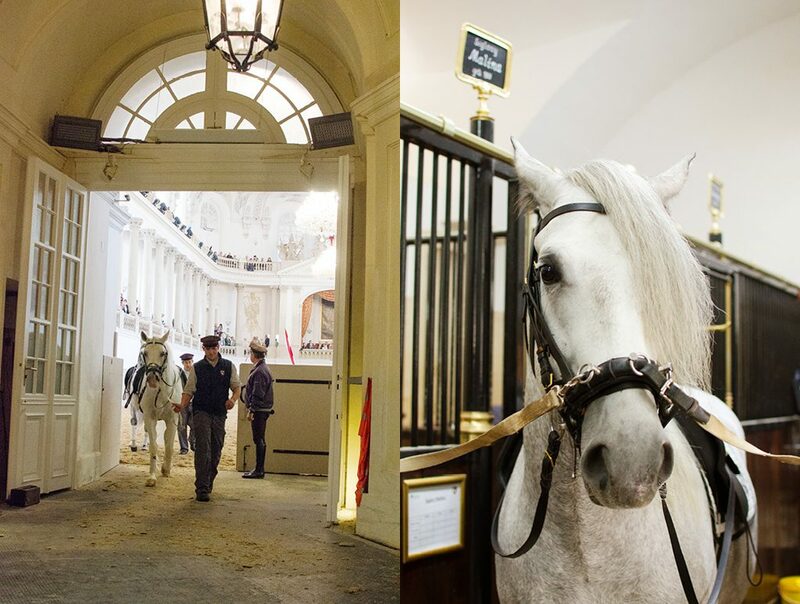 The white stallions or “Lipizzaner” of the Riding School have made this their home since the complex was completed in 1735. Now, I find that the Spanish Riding School is very much taken at face value in Vienna, meaning that while it has remained unchanged, the institutions to which it was connected and the practical use it provided the country disappeared long ago. So while it is a fabulous and uniquely Austrian spectacle, whenever I visit I have the feeling that there is more to the story than what is on display. So today I want to find out more about how the Riding School came to be and get a closer look at those fabulous Lipizzaner horses. And to do that we are going to take a Behind-the-scenes tour. For the first few times I visited, I just showed up and bought a ticket assuming there was just one show to see, and I ended up at one of the practice sessions. This is the daily training session in front of an audience, and you will see the distinctive moves and tricks of the Lipizzaners, but some of the horses and riders may be less experienced. And because there is a training aspect to the show, it is less formal. What’s great is that you get to see some of the junior horses in their evolution, and surprising things can happen. Once a week there is a gala performance. This is where the best, most experienced horses and riders show their stuff. If you want to see the highest expression of equestrian skill and harmony between horse and rider, you should go to this show. Finally, there is a tour that explores the architecture of the school and performance arena and takes you into some amazing hidden spaces inaccessible to the general public. That tour we are covering in a future issue, so stay tuned. 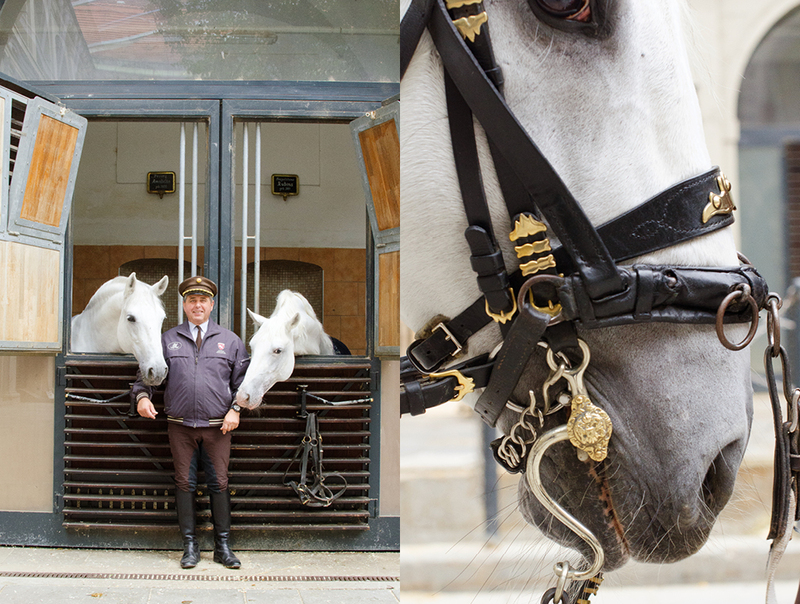 The First thing you should know about the Spanish Riding School is that there is no institution like it anywhere in the world. Nowhere else have equestrian skills been preserved and practiced in their original form continuously for over 400 years. So it was only fitting that UNESCO recently declared the Spanish Riding School’s horsemanship a cultural heritage to be protected at all costs for generations to come. The first mention of the Spanish Riding School was during the Habsburg reign in 1572. This “Haute Ecole” or High School of classical dressage movements evolved from the cavalry and the process of training horses for battle. In the heat of a crowded battlefield a cavalry man often needed to clear some space in order to break away from an enemy. 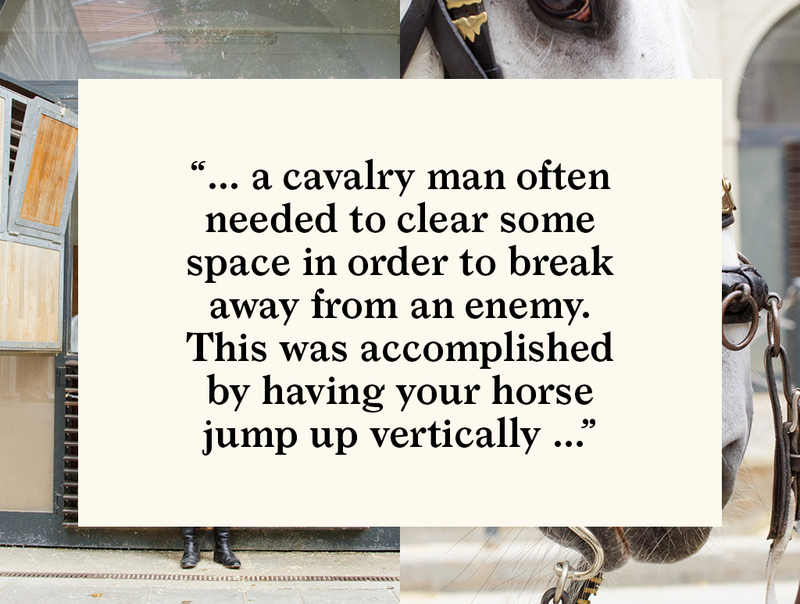 This was accomplished by having your horse jump up vertically with all four legs to distract the enemy, allowing you to then charge off to safety. This being the state of the art in military maneuvering, accomplished riders were often called upon in peace time to perform these difficult maneuvers for guests of the royal court. In 1729, Emperor Charles V decided to formalize the event and create a fit-for-the-purpose venue to maximize the political effect of the shows. 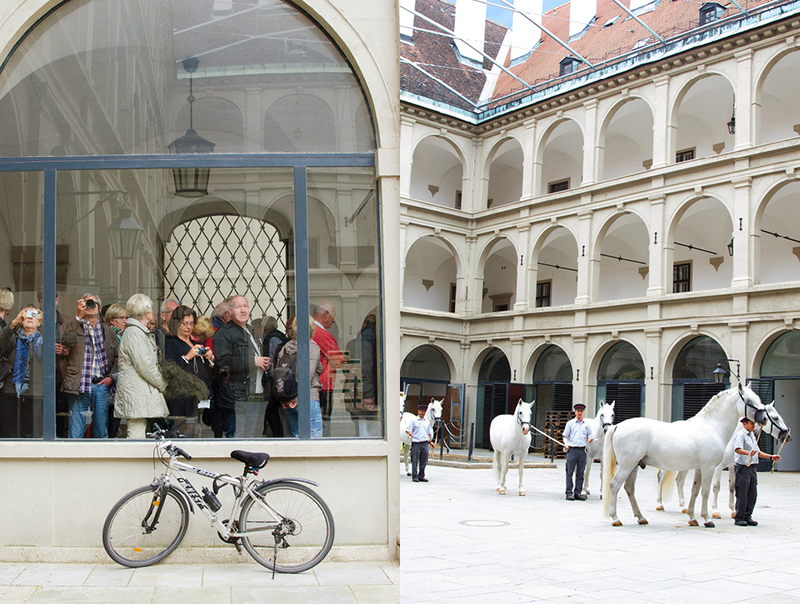 He commissioned famed baroque architect Fischer von Erlach to build the Winter Riding Hall, which is where the Lipizzaners perform today. And it is not only the physical structure that harkens back to the building’s origins. What happens in the building is also virtually unchanged. When you attend a practice session or gala show you will notice the riders always stop and tip their hats when they first enter the arena. What they are doing is saluting Emperor Charles V. And since Charles cannot be with us, his painting at the end of the arena stands in for the traditional show of respect. One question you might ask while attending a performance of the Spanish Riding School is, why is it called the “Spanish” Riding School and not the Austrian one? 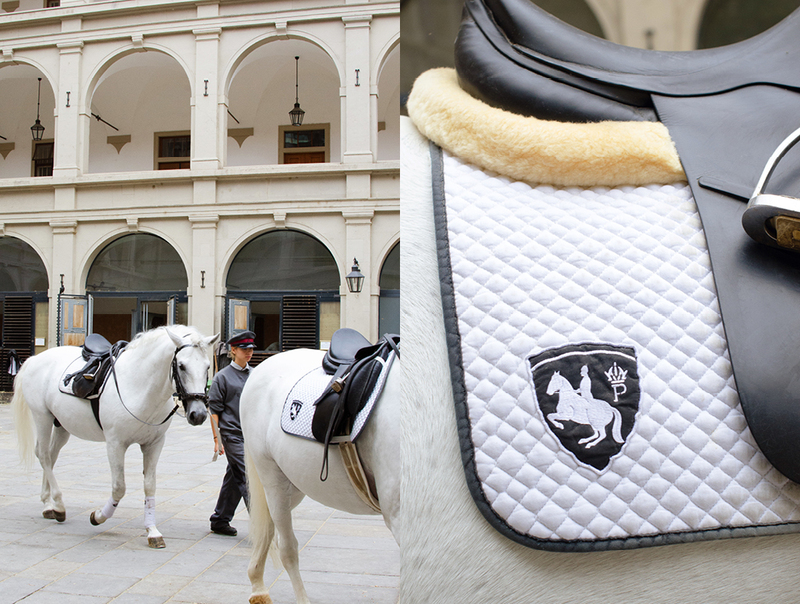 The Spanish designation comes from the original horses that formed the basis of the Lipizzaner breed. Back in the 16th century, when the Habsburg dynasty included all of Spain, Archduke Charles II established a stud farm in the village of Lipizza, now in modern-day Slovenia. Here he crossbred Spanish, Barb and Arabian horses producing the foundation of the eight lines of Lipizzaner horses. 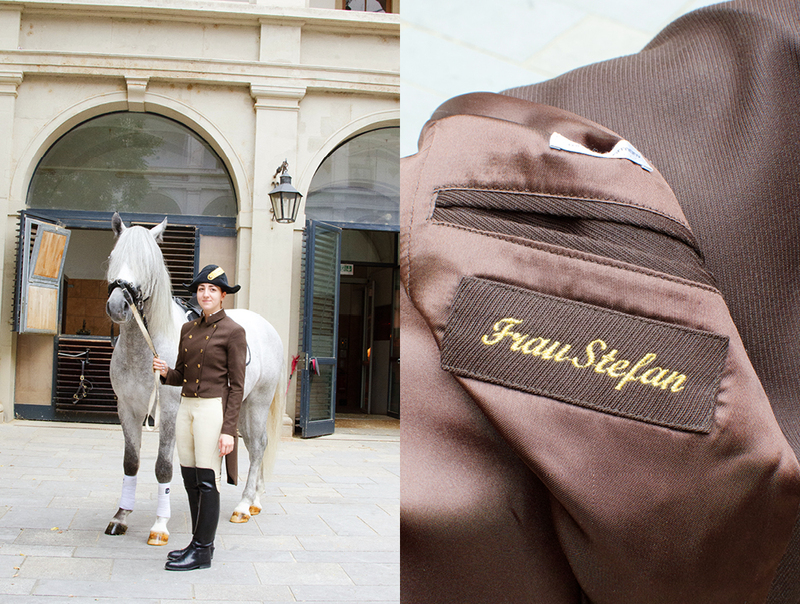 The horses are now bred at Piber, in Styria, the Spanish Riding School’s stud farm. 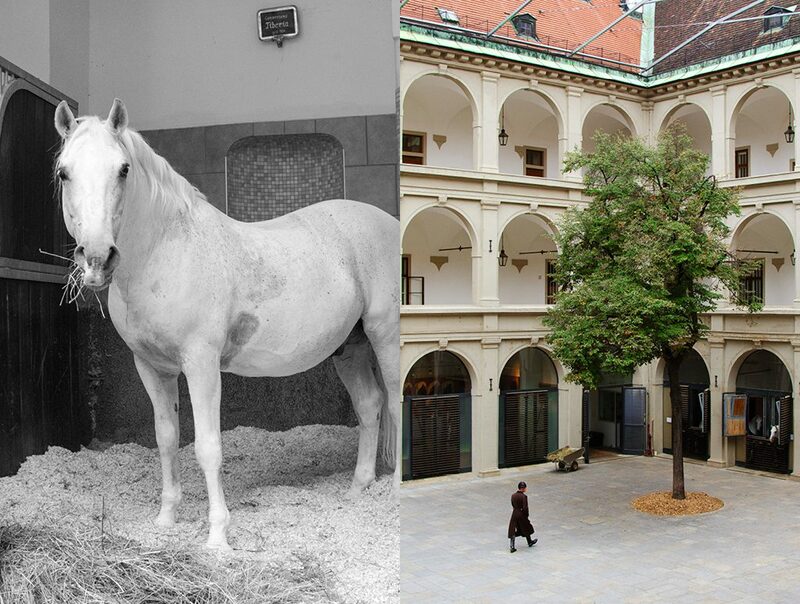 Since the 1920s Piber has taken care that only stallions which have proven themselves in the arena at Vienna, and specially chosen mares, will parent future generations of the Lipizzaner breed. 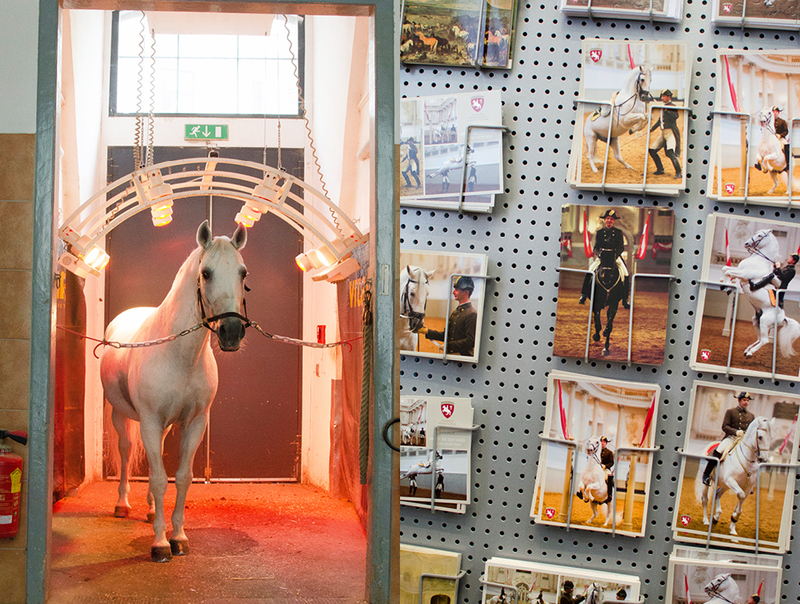 It is easy to determine each horse’s lineage while walking through the stables. 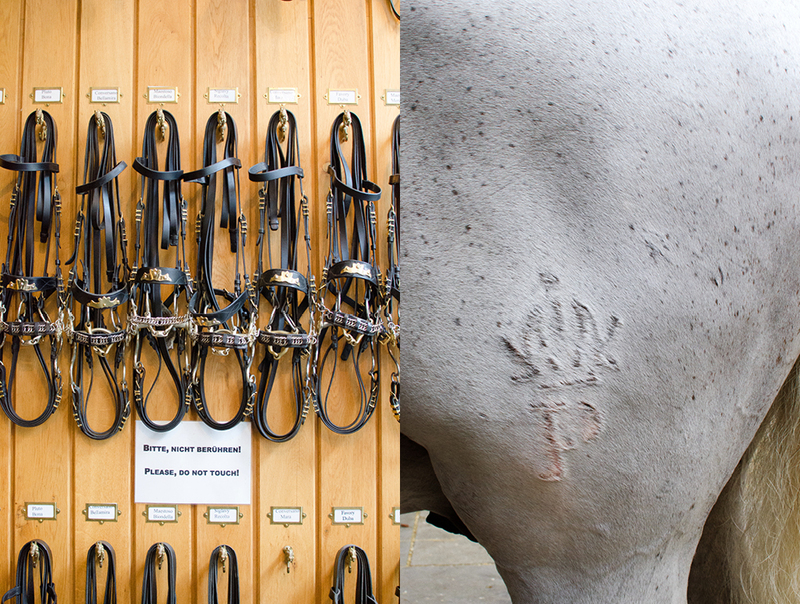 Above each stall you will notice the horse’s name displayed with its lineage coded right into it. Stallions are given two names, the first referring to the line of the sire and the second the name of the dam. Arriving early at the stable’s impressive Renaissance courtyard, the morning routine is in full swing. Caretakers are pushing around wheelbarrows loaded with hay, stables are being cleaned, and the horses are getting their special formulated muesli for breakfast while undergoing their morning grooming. Stalls around the courtyard are paired up in sets of two. Like rooms with a view they overlook all the action as an endless stream of tourist passes by the glass windows on the opposite side of the courtyard. Each group peers at the other, the horses just as curious as their human onlookers. The stable has a kind of college dorm feel to it. Each horse and its roommate are usually quite engaged. We run into Stable Master, Mr. Hamminger, and he tells us that he learns each horse’s temperament from a very young age. He gets a feel for who gets along with whom and conversely, which horses cannot stand each other. “If you get the combinations wrong”, says Mr. Hamminger, “it can be a mad house!” He obviously has an innate sense for each horse’s temperament because as you walk along the stalls the atmosphere is positively serene. Keeping 62 horses, fed, groomed and trained is quite a job and a small army of helpers and junior apprentice riders are on duty this morning to take care of the prized residents. We chat with one of the caretakers who is grooming the long white mane of a young stallion, getting him ready for his morning turn in the arena. Another caretaker applies a special oil on his hooves for conditioning. The horse is fidgety but is enjoying the attention. “He’s young”, says the caretaker. “He doesn’t yet understand all the hard work he’ll have to do to keep getting the attention”. Horses are usually sent to Vienna at about the age of four. Training horses to this level is long hard work. It can easily take five or more years to get them ready to publicly perform the signature Lipizzaner moves like the Levade, Courbette, Capriole, and Piaffe. For riders it takes even longer. A rider in training is referred to as an “Eleve” and for them to become accomplished it can take as long as 12 years. For almost all the institution’s 400 years the riders have been exclusively men. But in 2008, in a move that could only be called modernization, women were finally invited to enter the training program for riders. Now, after working her way up the ranks, 26-year-old Hanna Zeitlhofer has joined her male colleagues in the performances. With an additional three women “Eleven” currently in the program, it will soon be possible for there to be equal representation of male and female riders in the daily performances. The Spanish Riding School is by no means an action-packed riding extravaganza. It is a living museum where you can observe the successors of soldiers past, carrying on centuries-old traditions. It is a performance that shows at the highest level the synergy possible between horse and man: a mutual trust displayed between two living beings that enables the two together to accomplish great feats. Though no longer training for a life-and-death struggle on a battlefield, the beauty and simplicity of white horses flowing through the arena like magical creatures in partnership with their skilled riders is a sight to behold. On my first visit to the arena, I enjoyed the show, but knew little of the history and traditions of the institution. My next visit was so much more interesting, having learned about the Spanish Riding School’s fascinating past and having seen the inner workings that maintain this important tradition in the beautiful city of Vienna. 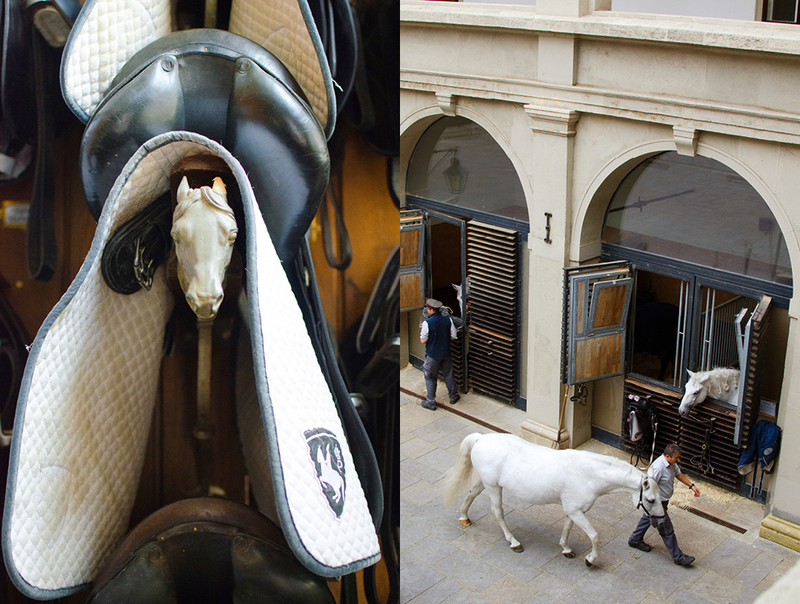 Planning a trip to the Spanish Riding School? Here is the current weather and what to expect for the next few days.